Jay Kristoff is the author of THE LOTUS WAR trilogy, a Japanese-inspired steampunk fantasy published by Thomas Dunne Books/St. Martin’s Press & Tor UK. Part 3, will be released in September 2014. He’s also co-author of the upcoming ILLUMINAE (with Amie Kaufman), a YA Sci-Fi… thing, to be released by Knopf/Random House in 2015. This book had me engaged from the start. Set in a dark and stifled world that is being torn apart by itself. Yukiko is like a gem of light amongst the polluted dross. She and her friend Buruu the Griffin are thrown together but respect and sacrifice create bonds that even the Shogun and others cannot break. Please may I have more? Wow Jay Kristoff! The second book is even better than the first one. Well done, Sir. The Shima Imperium is in a shambles. The Lotus guild is making its play for power over the dynasty. The rebels are in a race against time to prevent it all from happening. The other clans make a grab for it all while chaos reigns. Yukiko and Buruu are trying to aid the rebels while fighting her grief and rage. The mind powers by which they communicate are growing uncontrollably. There is gore and blood here. But this is a dark, damaged place so it is understandable. These people are cruel and savage, the result of living undervalued lives in a hellhole. I was greatly moved by Jay’s characters. And I despaired for the land that is dying beneath their feet. Thanks for a great read. Bring on The Lotus War #3. 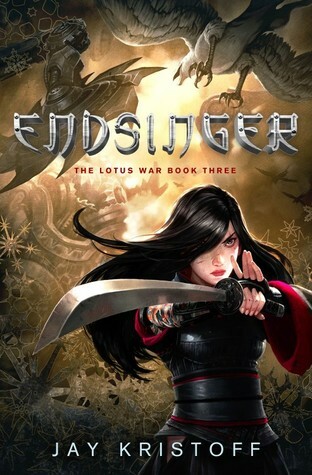 Endsinger is due out 23rd September 2014 and early reviews are already giving it 5 stars.